Pre-Entry for the Pro Tour SummerNationals is now CLOSED. You will be able to sign-up at the track starting at NOON on Thursday, July 15th, subject to availability in your class. Please call the SKUSA office IMMEDIATELY to reserve your race tires and spec fuel, as extra supplies will be LIMITED for purchase at the track: 951-491-0808. SummerNats Pre-Entry - Open One More Day! Due to feedback from customers we have decided to leave the SummerNats Pre-Entry open for one more day because of the holiday weekend. Enjoy the 4th!!! The first annual Superkarts! USA SummerNationals is promising to provide an early look at the on-track battles that the organization will likely see at its SuperNationals in November. The SKUSA staff will be heading for USA International Raceway in Shawano, WI in just about two weeks (June 16-18) and they are thrilled that the SummerNationals is expected to see a solid influx of local drivers for the race, pitting them up against the top drivers from their own ProKart Challenge, Mountain and the Central States regional programs. Add in the confirmed participation of NASCAR stars Jamie McMurray and AJ Allmendinger, and this race could be a solid pre-cursor of things to come in Las Vegas. SKUSA has an assortment of plans in place to make the SummerNationals an enjoyable experience for everyone who treks to Shawano to join in on the party. 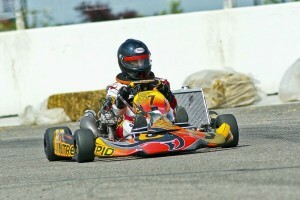 The second event of the season for the Superkarts! USA Central States Challenge took competitors from across the Midwest to the arch city - St. Louis - and the Gateway International Raceway for round three of the series. Contested over two days, racers competed on a temporary circuit inside the facility that incorporated the oval, road course and other paved areas. Drivers were given plenty of track time Saturday to get accustom to the long and challenging course before qualifying took place at the end of the day. Two heat races and the main event on Sunday decided the winners for the event. Evan Walters was one of the winners to leave Gateway as he made his first series start and scored the feature victory in S2 Semi-Pro Stock Moto. The event began with Derek Crockett as the driver to beat following qualifying with a 52.275-lap time. Walters was second in the order with point leader Lukas Johnson third. Crockett however would be unable to compete in the races following an engine failure Sunday morning during warm-ups. Johnson took advantage as he would go on to win both heat races. In the final, Johnson and Walters went back and forth for the lead. Lap traffic would come into play and Walters took advantage. Taking the lead, he would hold on to the checkered flag to score the victory over Johnson and Kyle Gnau.